Despite an off-season filled with promise, the season would again prove to be a disaster. Former Cincinnati Bengals offensive coordinator and head coach Bruce Coslet was brought in to run the offense for Dallas. Even though he was dismissed by Cincinnati, his history of high-powered offenses while running the Bill Walsh–style West Coast offense provided hope for the Cowboys. A promising draft which included former Oklahoma Sooners All-American selection safety Roy Williams in the first round and the free agent addition of Pro Bowl defensive tackle La'Roi Glover provided even more hope for weary Cowboy fans. The team was also covered throughout training camp and featured on the HBO series Hard Knocks with a strong emphasis on the anticipation of running back Emmitt Smith's road to the NFL's all-time rushing record. The Cowboys traded their original first-round selection to the Kansas City Chiefs in exhange for first and third-round selections and a 2003 sixth-round selection. The Cowboys traded their original third, fourth and fifth-round selections to the Chicago Bears in exchange for second and fourth-round selections. The Cowboys traded their seventh-round (acquired from Miami Dolphins) and 2003 fifth-round selection to the New England Patriots for a fifth-round selection. The air would immediately be let out of the Cowboys' balloon in the opening regular season contest which saw the team suffer a defeat to first year expansion team and new cross state rival, the Houston Texans. Though quarterback Quincy Carter again opened the season as the starter, he would eventually be benched in favor of newly signed Chad Hutchinson who, until that year, had been a pitcher for the St. Louis Cardinals after leaving Stanford as a two sport star. Many believed that owner Jerry Jones pressured head coach Dave Campo into starting Hutchinson much too early, due in part to the large signing bonus Jones paid to acquire the quarterback. Regardless, neither quarterback proved effective and the team once again spiraled towards a losing season. 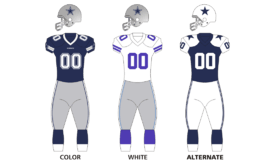 It is believed 2002 was the first time a NFL franchise had five African American starters on their offensive line, when the Cowboys lined up rookie center Andre Gurode, tackles Flozell Adams and Solomon Page, guards Larry Allen and Kelvin Garmon. The Cowboys kept making NFL history on October 27 at home against the Seattle Seahawks. Despite a close loss, Emmitt Smith would break the all-time career yardage rushing record previously held by Walter Payton. The game was stopped momentarily in recognition of the moment, allowing an emotional Smith to briefly celebrate with teammates both current and past who attended the game, as well as members of Payton's family. Smith would also later score his 125th rushing touchdown of his career on the same drive. The milestone moment would provide the lone bright spot of the year for the team and Smith, who would fail to reach the 1,000 yard rushing mark for the season for the first time in his career since his rookie season of 1990. Overshadowed by the NFL rushing landmark, safety Darren Woodson quietly also became the Dallas Cowboys all-time leading tackler. During a late season loss to the Philadelphia Eagles, reports began to surface that owner Jerry Jones had secretly met with former New York Giants, New England Patriots and New York Jets head coach Bill Parcells in relation to the head coaching position with the Dallas Cowboys on board Jones' private jet. Though this would prove to be a critical move to the Cowboys future success, it was nonetheless embarrassing for current head coach Dave Campo who had received no word that any potential moves were pending, and Jerry Jones was roundly criticized for the incident. On field ineptitude and off field controversy would once again lead to a 5–11 season, the team's third consecutive such finish. Dave Campo would be predictably dismissed after the season. Notable additions to the team include wide receiver Antonio Bryant, and center Andre Gurode. ↑ "2002 NFL Draft Pick Transactions". ProSportsTransactions.com.